Dice rollers are needed for lots of games, especially board games. For example, it can be used to decide who makes a move first. This tricky little thing is also used in math to learn about probability and luck and all of that. The only problem is that sometimes you just can’t find it! Or you simply don’t have it. Don’t worry if you want to play a game that requires at least one dice roller – you can find lots of online and offline alternatives. Even the Google search engine has its own dice. If you want to have one always at hand, it is better to download a special app. The dice roller apps are quite different. Take a look at nine of them to decide which one appeals your taste more and serves your purposes better. Dice Roller app is a very colorful app that has many cool features. When you open it, you see a green board. The moment you hold your finger on it, a circle menu appears. It offers you to choose one of six options – roll, dice, presets, clear, setup, nudge. The most frequently used (at least by me) are roll and dice. Dice feature is used to change the characteristics of the dice and roll is, well you know it, to roll the dice. Rolling the dice in this app is lots of fun! It feels as you have a real roller dice – the sounds, the graphics are all creating that special wonder of waiting for the results. The total results are shown below on the screen so if you don’t want to count, you can rid yourself of the useless activity (although it sharpens your brain so if you don’t have other challenging mental activities in your life, do it yourself). The setting options are practically limitless. You can change the color, the shape, the type and even the number of dice. So, the app will certainly satisfy even the most demanding downloaders. A great one for playing board games and just having fun. 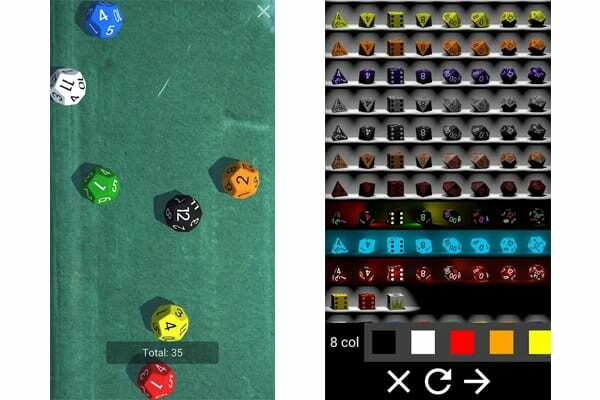 Dice by 7pixels is similar to the first app on our list. Just like that app, it has a powerful 3D physics engine that makes the whole process of dice-rolling look very realistic. There are lots of types of dice and they all come in different colors. The default ones are black with white dots. The peculiarity of this app is that you can roll the dice without tapping! All you need to do is to shake your device or tilt it up and the app will do its job. This is very rewarding. Just like in rolling a real dice, here you’ll need some physical activity (the one that doesn’t scare anyone). Besides, it is quite convenient. Imagine a situation when you and your friends are gathering together for playing a board game and eating Chinese food. Your fingers are all sticky, you don’t really want to touch your phone with them and even more so to offer using it to others. Nobody has a roller dice but you surely want to continue playing. What are you going to do? Of course, the best option is to download this Dice app! Get it right now. RPG Simple Dice is really simple. Basically, what you do is just tap on one of the dice and see the number. No awkward 3D graphics, no waiting – just tap & see. The app comes with no ads, so you can enjoy it to the fullest without worrying about data consumption. After all, it would be ignorant to load such a simple function as rolling the dice with irrelevant information. So if you are up for simplicity, this one is for you! 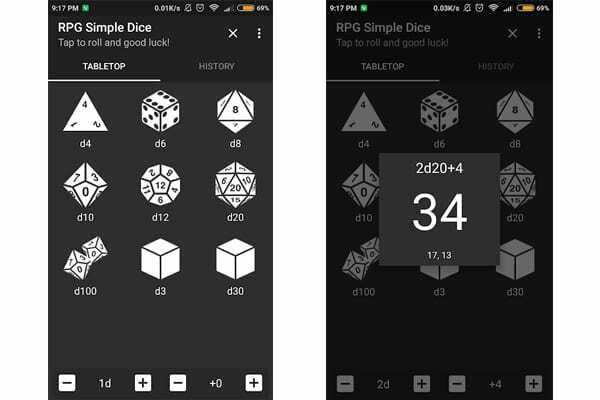 By the way, the app has different kinds of dice: d4, d6, d8, d10, d12, d20, and d100. Who knows? Maybe, you’ll want to ‘change the game’ and use a less common option. RPG Dice is created for RPG and boardgames but it can certainly be used for other purposes. 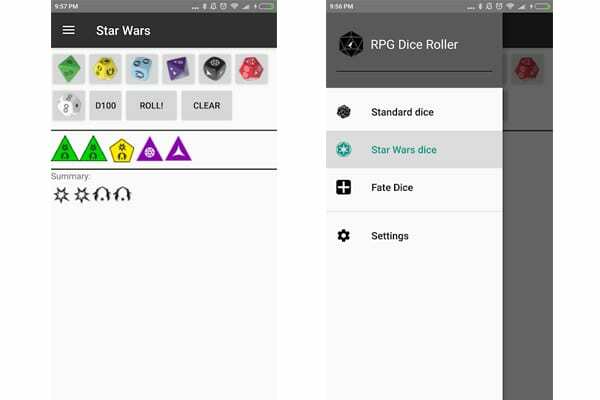 There are three kinds of games this app gives special attention to – Star Wars, Dungeons & Dragons or Pathfinder (D20 system), Fate & Fudge. The standard set is compatible with lots of other role-playing games. As you see, the interface is clean. The app though has ads, which is why we highly recommend you to take a look at the first three options – they don’t give names of the games but perform quite the same functions. If you find that only this app is able to provide you with specific dice for a specific game, then, of course, go ahead! 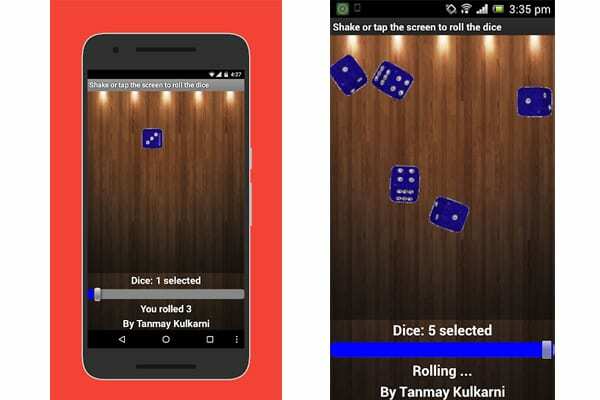 Roll the Dice is an app created by individual developer Tanmay Kulkarni. It deals only with 6d rollers. You can choose one to five roller dice. The rolling occurs quite interestingly. You can both tap the screen and shake the phone to do it. The animation, as well as the graphics, are quite simple, which rids the app of excessive weight. At the same time, everything looks stunning. There are no details you don’t need and, what’s more important, there are no ads. This one is definitely worth downloading. It combines all the three components a one should look for in such apps: light weight, simplicity, and absence of ads. So, what are you waiting for? Tap that Google Play button right now! 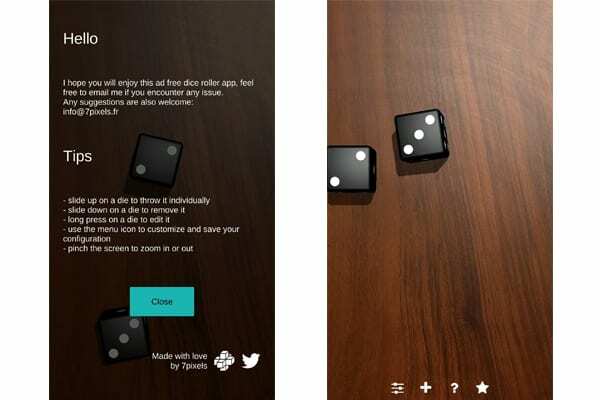 Another Dice Roller app. This one’s full name is ‘Dice Roller: Six-sided dice at your fingertips’. Appreciate the fantasy! One to five 6-sided dice can be rolled at a time. There are three steps you to need to make. The first one it to tap the screen (it is not rocket science, bro!) The second one is to choose how many dice you want to roll, and finally the third one is… you know it. The app is quite simple. It is also lightweight. If you need this particular type of dice – 6d – you can download this app. After all, it is free and doesn’t require any permissions! One more quite simple app to roll the dice. 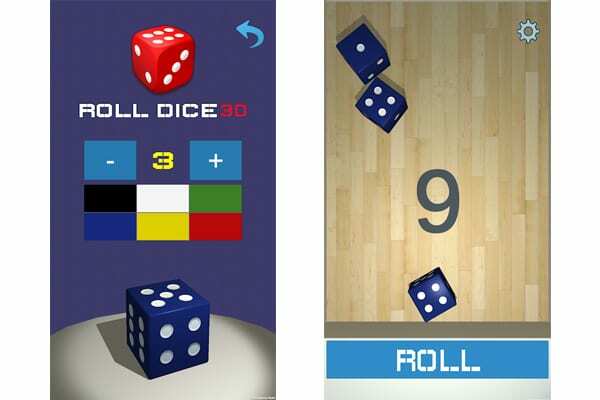 Roll dice has quite a complex 3D graphics which places it in one row with the first two apps on our list. However, in terms of functionality, it is less complicated. There is only one type of dice, which is a 6-sided dice. Although you can choose the number of dice you want to be thrown. And also the color of the dice if it makes a difference for you. Well, who doesn’t like playing with colors! Here, you can also just shake your device in order to start the ball rolling. One more cool feature is that sometimes the app shows the dice in an incorrect position so you can’t really know what number can be considered as valid. This thing happens in real life sometimes, so why not to add such an accident probability to a dice roller app? All in all, if you need 6d, this a great option for you. This is one more dice roller that deals with 6d. 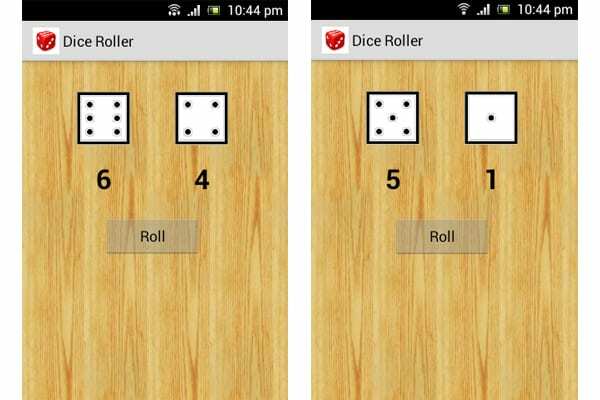 You can choose one of three option – roll one, two, or three dice rollers simultaneously. The history is shown on the side of the rolling process. No 3D graphics or shaking – just tapping on the screen. Everything’s pretty simple. The only drawback of this app is that it has lots of advertising. Beware of it. If you don’t want to see any irrelevant information on your phone, it is better to abstain from downloading this app. Although it is simple and does its job. 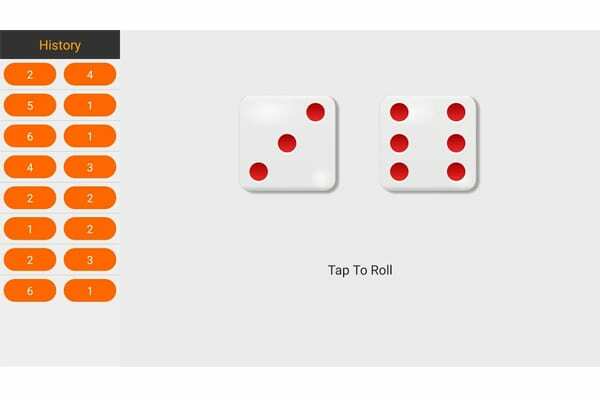 This dice roller app as you can see is the king of simplicity. It weighs only 881k! So don’t worry about your storage space. 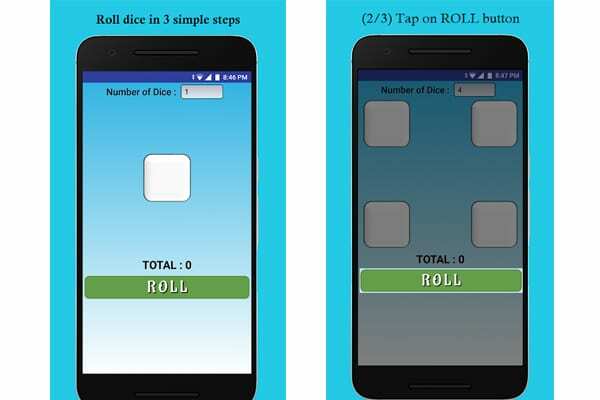 The app allows you to roll two dices. You just tap ‘Roll’ and it gives you two numbers. There’s also a sound which you can turn on and off depending on your needs. The only drawback of this one is ads on the bottom of the screen. It is a pity the app has them. Add to that quite a limited functionality and you’ll see that this download is not really worth it. Unless! Unless you need an app with such functionality and don’t mind a little bit of your data being consumed for the sake of it. To wrap up, there are lots of dice rollers on Google Play. Some of them are good, others are complete junk. That is because it is quite easy to create such an app and many developers try to earn money by doing it. Choose apps that are ads-free. They will not only bring you more pleasure but also turn out to be more helpful. It is time to start playing!